Good evening! Jessica here for the Third Day of Christmas at A Blog Named Hero! If you missed it we’re celebrating over the next ten days with some fabulous crafty celebrities! Today I’m hosting the super talented Kelly Rasmussen who has a gorgeous watercolored card to share! Kelly stamped the Peace and Joy image in antique linen distress ink and then carefully watercolored over the top. It gives the appearance that it was hand-written rather than stamped! I love the look of this card and the way she blended the colors in the “handwritten” sentiment! So pretty! I have a bad habit of forgetting about my wood-mounted rubber stamps but I was doing a little crafty organizing a few days ago and found this elegant stamp. I stamped the tree and sentiment on a kraft cardstock panel with versafine and heat-embossed it with clear powder. 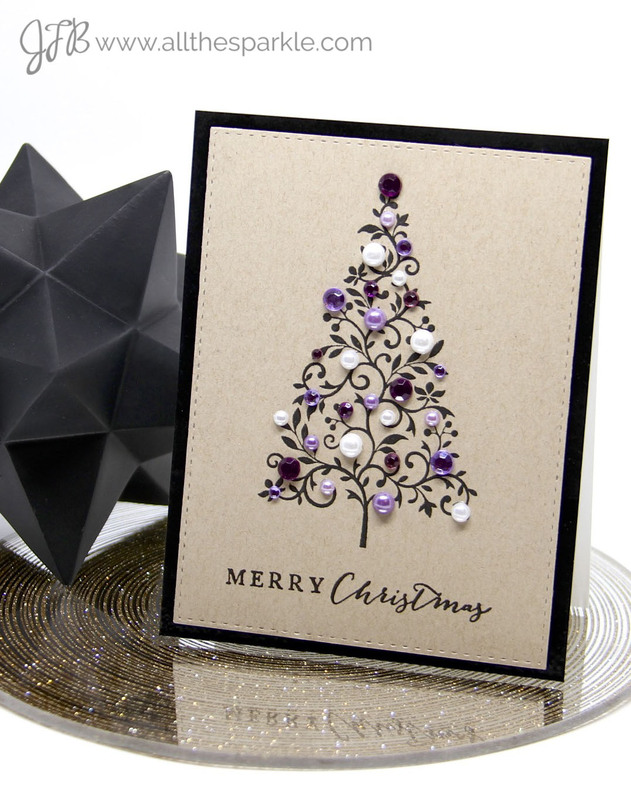 Next I “decorated” my tree with a mix of purple and white gems and pearls. Then I swiped the edges of my card base with versafine and heat-embossed it with clear powder to create a shiny black frame for my kraft panel. To finish the card I adhered the kraft panel with foam mounting tape for a little extra dimension. Thanks so much for visiting today and make sure to check back tomorrow to see what Michelle and our next crafty celebrity guest have created! The sentiment stamp looks brilliant, it really does look hand written. Perfect and your card is so pretty. Its always worth checking back through the older stamps. Maybe Hero Art should have a 'use your favourite older stamps' regular challenge. So many of us have older stamps we dont get to use enough and really dont want to part with. Were there swirlys on the original stamp Kelly used or did she add them when she did her watercoloring? BTW…I was SO concentrating on how Kelly did her card I neglected to tell you both how chic and sophisticated your cards are…..love them both!! Kelly, greens and blues are my fav colors! Both cards are beautiful and shockingly simple,though they certainly don't look it! Thank you for sharing the tips and tricks with us, I will be trying both of these ideas on my own cards. Well ladies they're both beautiful! I think both these stamp sets are in my near future, especially with how simple yet gorgeous the results are. Thanks for sharing and inspiring. This card is just gorgeous!!! Oh, I have that wooden stamp in a drawer, forgotten! Thanks for the reminder and inspiration! The green and blue looks so nice together and the purple on the tree is a great look also. I love the peace and joy card. I do forget my wood stamps sometimes too. Especially like the ombre inking.